Don't you love buttons? 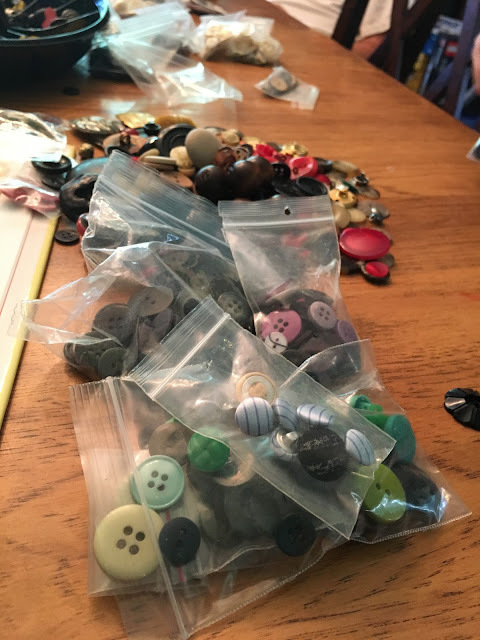 I recently found this box of buttons for $5 at a garage sale--it was even all sorted and separated in little baggies. I thought we'd explore a bit as we read The Button Box (again) and we started opening a few buttons and putting them in a divided, recycled cookie tray; however, children had other ideas and I'm pretty open to following their lead. Soon all these little baggies of carefully sorted buttons were in one big pile. And then we started sorting again! 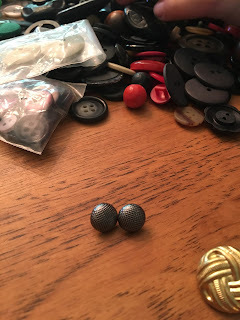 We found buttons that had four holes or two holes or just a shank. 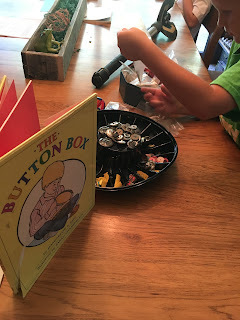 The Button Box shows a boy opening his grandmother's button box and sorting through the treasures. It also shows how buttons could come from shells, wood, deer antlers, and more. 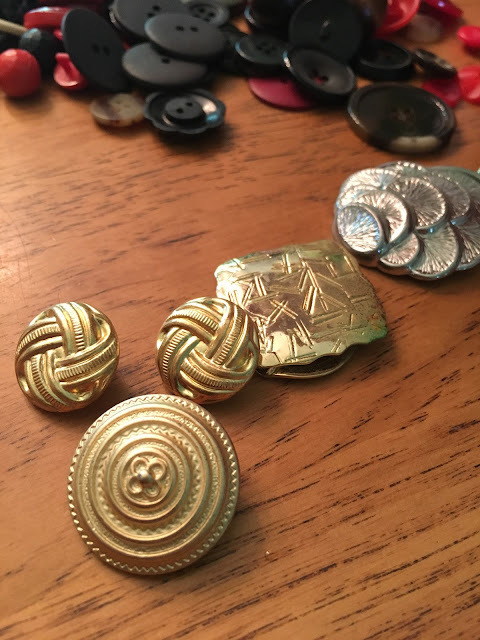 He makes a string and button toy, counts his "gold" as he puts them back, and then ends with a little history on buttons. I also played with my grandmother's button box. Do people still have button boxes? I hope so! Our button box actually had antler/bone buttons, too. So neat to see the connections from the book! We found some that the boys looked like eyes and separated out the shiny ones! 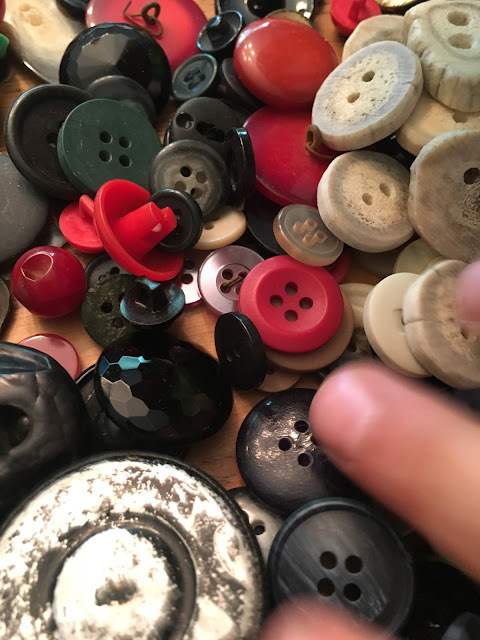 Sort, count, create pictures from buttons, puppet eyes, etc. As children get older you might chart types of buttons even, bringing in a math component if they are interested. I was surprised even my 8 year old and almost 11 year old were enjoying these as well. My youngest (almost 5) spent over an hour with these today. I'll leave them out this week for them to peruse as they'd like! 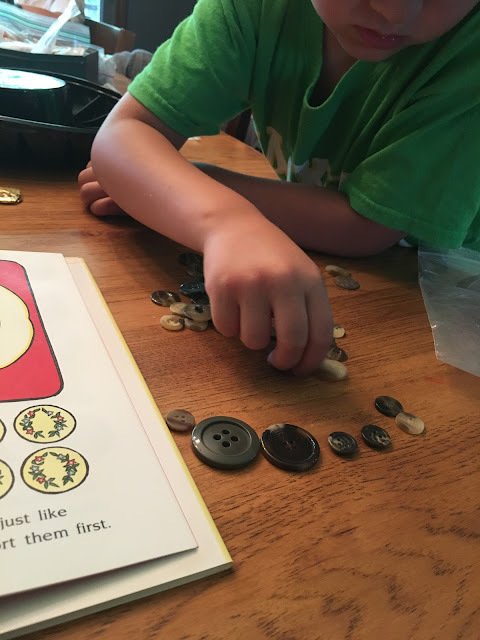 Interested in Loose Parts and Books? Find my list here! Here is a video of the book. Here are some other extension activities as well. How do you all use buttons? In many types of spaces, we do a little planning for our learning experiences. I have heard many say to "just let them play"; however, most spaces also need to meet learning standards and such. Even in an emergent learning setting, a little planning can help us pull things together for success. 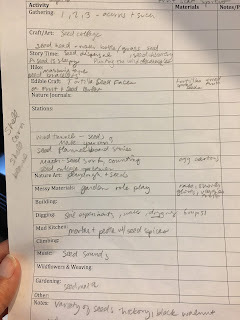 I have used a planning sheet similar to this for the last 5 years I have done a nature preschool group. I also use a similar approach to event planning using an outdoor classroom. 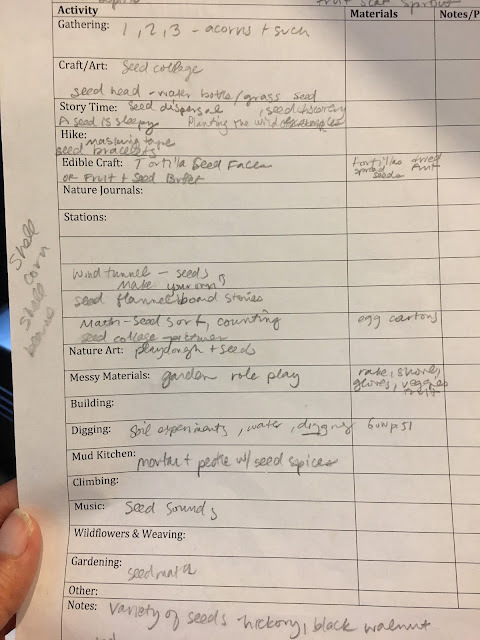 Our basic rhythm for our group is to have a gathering activity (or more), craft/art, a story time, hike, wash hands, edible craft (snack), and then open options centered around our areas of the outdoor classroom. We try to do as much as this outside as possible, but do have some moments inside as well. Below is a very sketchy example of seeds. Children are free to participate or not and we follow the children's needs and interests, as well as any seasonal or unexpected finds when we are outside. We may not get to all of these options and it is okay if the children do not do each option. Having a variety allows the needs of all children be met. Since I typically do programs at a place where other activities are happening, I schlep a lot of stuff around. This helps me remember everything I need. See some examples of the results of this under "Nature Preschool" on the blog. Here are a few examples of how our activities turned out. Honestly, there is usually enough that could work for a week at a time; however, we just had one morning a week for a couple of hours. Find the planning sheet here. Let me know how you use or modify it--I love seeing how others use similar stuff! Don't you love finding something at a garage sale? 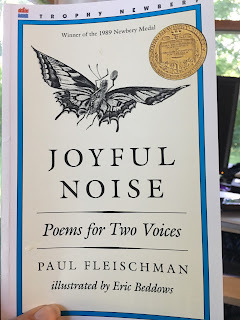 I stumbled upon Joyful Noise recently. The mom said she loved it in her classroom when she was a teacher. Note the Newbery Medal? I like Newbery books! 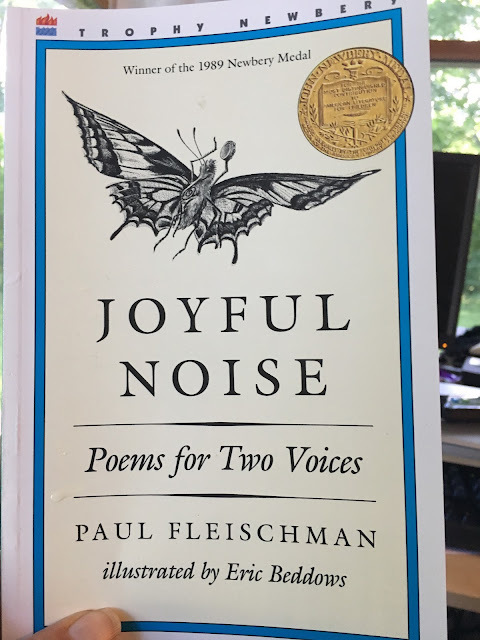 It also is all nature based, with poems that are meant to be read by two people. As I read through the book, I wanted to hear what these would sound like when presented by two people. Of course, I took to Youtube! Here is one rendition of the poems.